Sarah Goes Hollywood! Snags Swag While Shopping Reality TV Show On Her Favoritest Subject: Herself! Oh Sweet Sarah, does your goodness know no bounds? Sacrificing her precious time and energy to go to that terrible liberal cesspool Hollywood just to dazzle the Tonight Show crowd with the hilarious jokes she didn’t write before heading over to the “Oscar gift suite” to scoop up piles of fancy clothes and cosmetics that somebody else paid for, and who knows maybe even get the guy who produced that Survivor game show to make a special reality show about her, Sarah Palin, to make even more money for, you guessed it, Sarah Barracuda Palin. But first things first. Lest she be rude and offend her gracious hosts, Sarah must fulfill her patriotic duty as an American by partaking in all traditions Hollywood, like collecting even more free goodies she didn’t earn or deserve. Hooray! Sarah, insanity? No freakin’ way! Well, excuuuuse her if she doesn’t believe in Socialism! Besides, she’s just trying to get her Kim Kardashian on to prepare for life on the small screen as the new star of her own reality TV show, The Alaska Experiment (We Now Regret). Multiple sources confirm that Palin and uber-reality show producer Mark Burnett have been making the rounds in Hollywood this week to pitch a TV docudrama about Alaska. 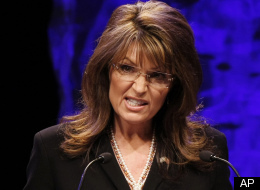 One source called it a “Planet Earth-type look” at Palin’s home state. Yay! Does this mean we get to see Sarah calling li’l Trigger a “retard” (satirically of course) while shooting endangered wolves from a helicopter as she gets her hair styled, and Todd hunts for moose on his snowmobile below, while Bristol and the rest of the Palin daughters continue to get knocked up and go on fun abstinence tours across America? Hey, whatever it takes to get the hell out of Wasilla, right? Now how you gonna argue with brilliance like that? Besides, she’ll just quit halfway through the first season. She’s so rogue like that. 1 comment to Sarah Goes Hollywood! Snags Swag While Shopping Reality TV Show On Her Favoritest Subject: Herself!